The Late Submission policy allows you to automatically deduct points on all late submissions. A submission is labeled late when it has been submitted past the due date. Only assignments with a status of Late will be affected by the Late Submission policy. The late policy will be applied to a submission when it is graded. The Late Submission policy allows you to define a percentage of the total points possible on an assignment that will be deducted for late submissions. Points can be deducted per day or hour the submission is late. 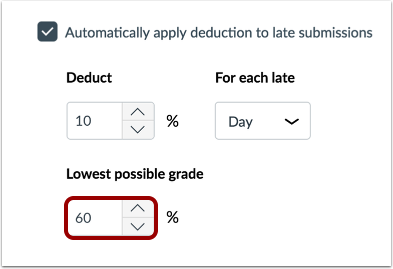 For example, if the Deduct field is set to 10%, the interval is selected for Day, and the assignment is worth 10 points, 1 point will be deducted per day. If a submission is 2 days late, and the student is awarded full points, their final grade on the assignment would be 8 points (2 days late x 1 point deduction per day = 2 point Late Penalty). Additionally, you can define the lowest possible grade that can be given to a student. For example, if the Late Submission policy is set to deduct 10% per day for late submissions, and a student submits 8 days late to an assignment worth 10 points, the student's grade would be 2 points if they were awarded full credit on the assignment (8 days late x 1 point deducted per day = 8 point Late Penalty). However, if the Lowest grade possible is set to 60%, the student's grade will be adjusted to 6 points. Setting a Late Submission policy affects all assignments in a course, including assignments with due dates in the past. To exclude a specific assignment, mark the submission as something other than Late in the Grade Detail Tray. For the calculation of the Late Penalty, days late will be rounded up to the next whole number. For example, if a student submits 1.3 days late, the Late Penalty will treat the student as 2 days late. This behavior also applies for hour durations. Applying a deduction to late submissions will automatically affect any previously graded submissions. Therefore, the Late Submission policy should be set up when a course is created prior to creating assignments. The Late Submission policy will not affect submissions in closed grading periods or submissions for concluded enrollments. The Late Submission policy will not be automatically applied to No Submission or On Paper assignments. However, a Late label can be added in the Grade Detail tray. 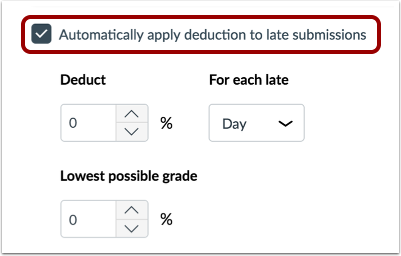 Enabling a Late Submission policy in the New Gradebook will remove the option to revert to the old Gradebook. In Gradebook Settings, view the Late Policies tab. Click the Automatically apply deduction to late submissions checkbox. Note: Selecting this checkbox will automatically apply the deduction you set for any late submissions in the course that have previously been graded as well as apply to future late submissions you grade. 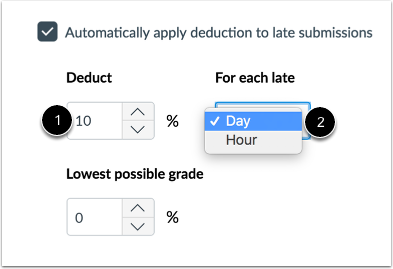 To set the percentage you want late submissions to be deducted, set a percentage in the Deduct field . Then set the interval for which you would like Canvas to deduct points in the For each late drop-down menu . Available interval options are Day or Hour. To set the lowest grade a student can be awarded for a late submission, set a percentage in the Lowest possible grade field. View the affected grades in the Gradebook. 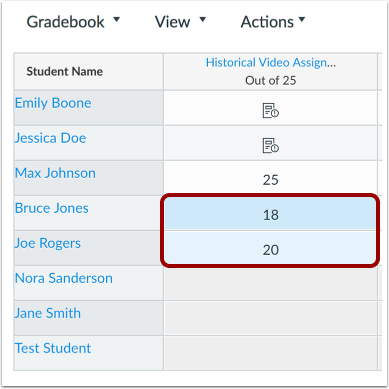 In the Grade Detail Tray, you can view details about the student's grade and adjust settings on each student's individual submission. 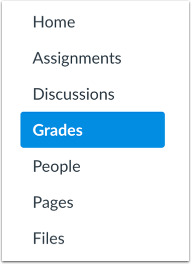 In the Grade info section , you can view or edit the grade you awarded the student for their submission, the late penalty deduction, and the student's final grade on the assignment. In the Status section , you can view how many days late the student submitted the assignment and adjust the amount of days late in the interval field. You can also manually change the submission to a status other than Late, but please note that changing the status will remove any late penalties that had been automatically applied to the student's submission. If you set a late policy, and then adjust any of the parameters, Canvas will display a warning to notify you that changing the late policy will affect previously graded submissions. To exclude a submission from the late penalty you will have to manually change a submission's status to something other than late in the Grade Detail Tray. Previous Topic:How do I apply a Missing Submission policy in the New Gradebook? Next Topic:How do I override a student's final grade in the New Gradebook? Table of Contents > New Gradebook > How do I apply a Late Submission policy in the New Gradebook? Re: Why is the grade recorded in the gradebook after the student completed the assignment after the due date?